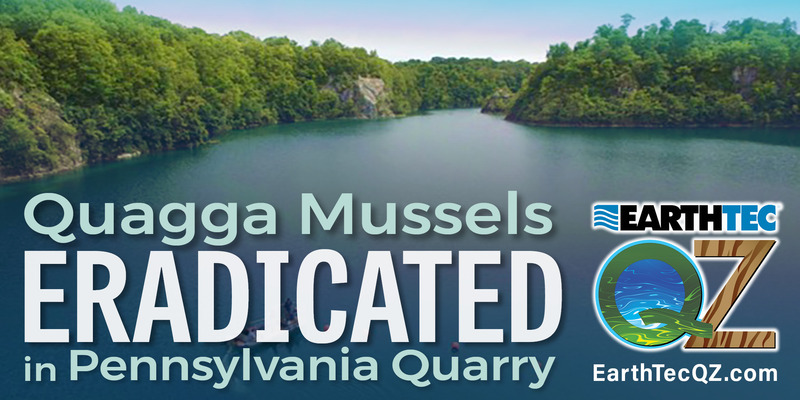 Recent test results show no evidence of quagga mussels in the historic Billmeyer Quarry near Bainbridge, Pennsylvania. The results offer renewed hope that a recent project to eradicate the invasive mussels was successful. If the quagga mussel population fails to rebound . . .
Four southern states have approved a solution for controlling nuisance snails. The advanced, copper-based solution kills snails that clog irrigation pipes and host harmful parasites. The approvals by Alabama, Arkansas, Florida and Texas spell relief for several hard-hit industries in . . .
Zebra mussels are in the news again. While Austin, Texas continues to grapple with a foul-smelling infestation, Pennsylvania water experts will learn how to stop the tiny invaders from fouling their own pipes. The annual meeting of the Pennsylvania Rural Water Association (PRWA) will include a seminar by . . .
Rudy Stankowitz has a mission. He wants to help pool operators defeat black algae – and he may have found a way to do it. Stankowitz recently ran a real-world experiment to see whether prolonged contact with low levels of copper would kill black algae. The results were surprising. Water industry experts from two western states will meet in California’s Palm Desert this month. The California-Nevada section of the American Water Works Association (CA-NV AWWA) will hold its Annual Fall Conference at the Westin Hills Resort, Oct. 22–25. Removing toxins released into drinking water by harmful cyanobacteria blooms will be . . . Experts to Discuss Cyanobacteria and Quagga Mussel Control in the Western U.S.
Water treatment experts from three western states will meet in Las Vegas this month. The annual Tri-State Seminar brings together leaders from Arizona, California and Nevada. This year’s meeting takes place in the face of ongoing challenges . . .
Summer is peak cyanobacteria season for water treatment plants. This means taste and odor complaints. Controlling taste and odor problems while keeping costs under control can be difficult. A South Texas water treatment plant found a way to do both. Team Earth Science Labs cycled and walked to help cure diabetes in the Arkansas Tour de Cure®. The team raised $3,940 in its fourth outing at the annual benefit. This put ESL at . . .
Ohio’s water industry leaders will meet this month to discuss best practices in drinking water treatment. The One Water Conference and Exposition convenes in Columbus, August 27–30. The event follows Governor John Kasich’s recent executive order to . . .
July is Lakes Appreciation Month. The annual event highlights the importance of lakes for drinking water, recreation, and wildlife. It’s a reminder to pause and appreciate this most valuable resource. Arkansas-based Earth Science Laboratories has partnered with NALMS in celebrating the event by launching . . .
What if Quagga and Zebra Mussel Prevention Fails? The Utah Division of Wildlife Resources has an excellent video on preventing the spread of quagga mussels. If prevention fails . . .